Wishing for weight loss and fitting into your favorite clothes is about as successful as the cabbage soup diet, right?! Experience the science backed fat burning AND muscle building workouts to help lose weight and reshape your body in as little as 10 minutes a day! Because You have a lot on your plate & lack of time has increasingly become the most common barriers to weight loss, confidence and body love for most women…Right? Reshaping your body and life doesn’t have to be as time consuming, expensive and complicated as you think! Sure, you can lose weight running on a treadmill for an hour every day or by casually lifting a few weights. But let’s be honest, who has time these days for long, drawn out workouts? You’ll eventually plateau, get bored, lose motivation and end up frustrated with the lack of results…once again, right? The secret to burning fat, gaining strength and reshaping your physique is intensity, not time! Now, Imagine a workout plan specifically designed for those who want big changes without strict time commitments…. Strategic body toning and fat burning workouts that fits into YOUR lifestyle. Torch fat while preserving and building lean muscle at the same time! Tone in 10 is perfect for anyone who wants quick results with limited time requirements. The workouts can be done anytime, anywhere without the need for fancy equipment or pricy membership apps or programs. The secret behind Tone in 10 workouts is the afterburner affect (EPOC). With the structure and intensity of the workouts, your body burns MORE calories AFTER the workout is over! These workouts boost metabolism and turn your bodies into a calorie and fat burning machine! Private Community and Instant access to me! Most programs these days require membership fees, not this one! Tone in 10 was developed out of necessity more than anything. The program combines High Intensity Interval Training with weight training to burn more calories and reshape your body faster without wasting precious time. The need for quick, effective, fat-loss workouts that are easily accessible without fancy equipment has never been greater. I know first hand the struggles of wanting to look and feel more confident but lack of time stands in your way. What sets Tone in 10 workouts apart from other training methods is its ability to create an “Afterburn affect” or EPOC (Excess Post Exercise Oxygen Consumption). This means your body continues to torch fat and calories after the workout is over, even while you are doing nothing! Not only do you need quick, sustainable results from less time consuming workouts, you need support, motivation and encouragement to create a full lifestyle change. I want to give you exactly that! Results come from Intensity, Not Time. The key to getting the best results is intensity, not time. By alternating between structured work/rest ratios, you are working both aerobic (cardio) and anaerobic (muscle building) at the same time allowing you to burn more calories and reshape your body in a much shorter period of time. >No more feeling guilty for taking time for yourself! Working out is more than just reshaping your body… it is about reshaping your life and feeling more confident, healthy and happy. Life is busy, I get it! These are real workouts designed with your busy life in mind! 110% effort in 10-30 minutes beats 10% effort for 2 hours giving you greater results in much less time. Science has proven over and over thet HIIT training is one of the best and fastest ways to burn fat, lose weight and reshape your body is less time. Increase fat loss by unlocking 24-7 calorie burning. With the unique design of the Tone in 10 workouts, you will see how quickly your body burns fat and tones up at the same time! Strict time requirements and fancy gym equipment can make sticking to a workout routine almost impossible. These workouts fit perfectly into your busy life leading a complete lifestyle change! Whether you are a beginner or more advanced, these workouts can easily be modified to your level so that you can get the best results. Strategically designed workouts will help you get stronger, burn more calories and tone up quickly. The new science proves that intensity drives results, not duration. Do you want to see better results faster? Learning to take just 10 minutes a day for ourselves not only improves our waste lines but also our overall health and happiness. When we feel better physically, we are happier and more confident. Consistency is key to success however it is impossible without the proper support. Research shows that one of the best ways to reach and maintain your goals is with the proper support. And that is exactly what Tone in 10 gives you! A supportive community of likeminded women helping each other to uncover their ideal health, happiness and confidence! First, and most important, I am a mom of two beautiful little girls and wife to an amazing husband. 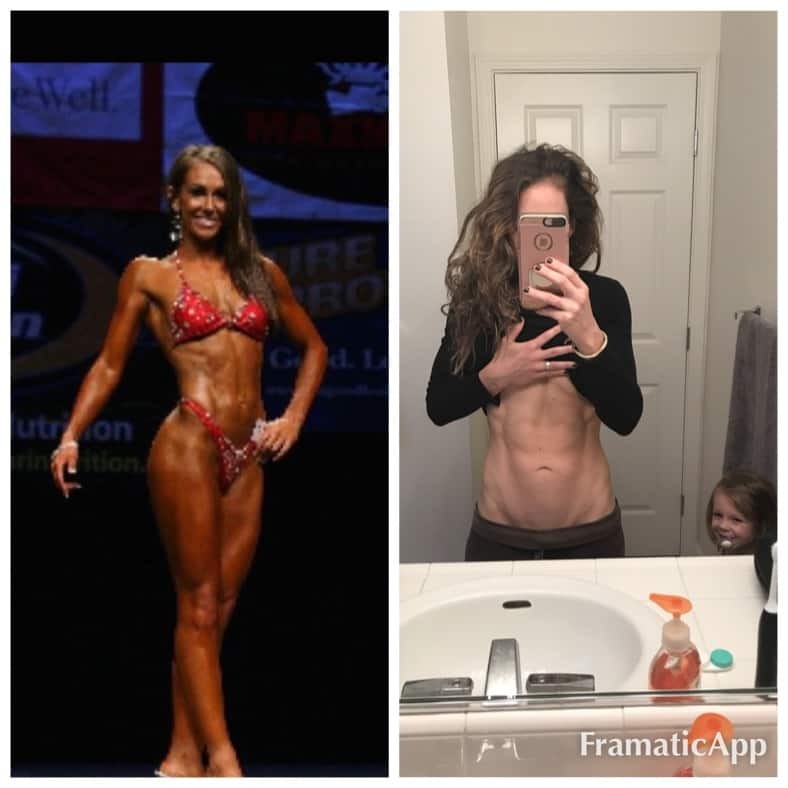 I am also a personal trainer with a BS in Exercise Science and have helped thousands of ladies just like you, uncover their ideal health, happiness and confidence through losing weight and gaining strength, both mentally and physically. My goal is to empower women, especially busy moms, to take care of their own health and happiness without feeling guilty or selfish. Learning to take just 10 minutes a day for myself has made me a more loving wife, more patient mother as well as helped me thrive in my business and personal relationships. Just 10 minutes a day can transform both your body and mind leading to a more confident and fulfilling life! For many years, I wasted so much time working out only to see minimal results. In my mind, the longer I worked out, the more calories I would burn and the better results I would get. After the birth of my first daughter, I worried how these long, drawn out workouts would fit into my busy schedule. Nor did I have desire to spend so much time away from my family to exercise. But giving up on my workouts and health was not an option. So my time spent exercising had to be quick, intense and intentional. Despite working out LESS I was seeing BETTER results than I had in my entire 15 years of working out, even after two babies! The science backed workouts in Tone in 10 are designed to accelerate fat loss, burn more calories and improve your overall lifestyle without strict time requirements. Only have 4 minutes to burn some calories and release some stress? No problem! Maybe you have time for some serious fat burning? I got you covered! This program teaches you how to maximize your time working out for greater results.